Every kid knows a bedroom with a futon is pretty cool, but the Donco Twin Futon Stairway Bunk Bed – Honey takes it to a whole new level. Ideal for making the most of their bedroom space, this futon-bunk-bed mashup is crafted of solid wood in a rich honey finish that’s sanded and sealed to prevent splinters. Vertical slats create a grown-up appeal kids love, and yep, the matching staircase comes included, with four drawers on the steps and two shelves on the side built right in. You’ll also have the option to add a two-drawer under bed storage unit or roll-out trundle to your order, too. Bunk bed: 104L x 44W x 70H in. Under bed storage: 37L x 23W x 12H in. Trundle: 74L x 41W x 10H in. 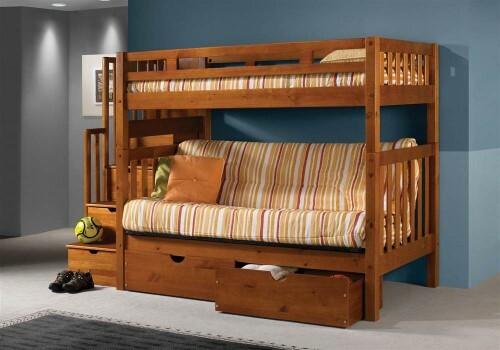 Top bunk comes with a slat roll foundation that is designed for use without a box spring or bunkie board. Stairway is interchangeable; designed to go on either side. There is a functional drawer under each step. Rollout drawers provide extra storage. All wood is sanded and sealed with a clean, smooth coating to prevent splinters. Our finishes are child-safe and lead free. Stairway allows easy access to top bunk. Top bunk accommodates a standard twin sized mattress, Futon accommodates a full size futon mattress neither mattress is included. This package includes: (4) side rails, (2) head boards, (2) foot boards, (1) staircase, (13) slats, (4) Drawers to go under steps, (2) roll-out drawers, and (1) metal futon frame. Mattresses are not included.